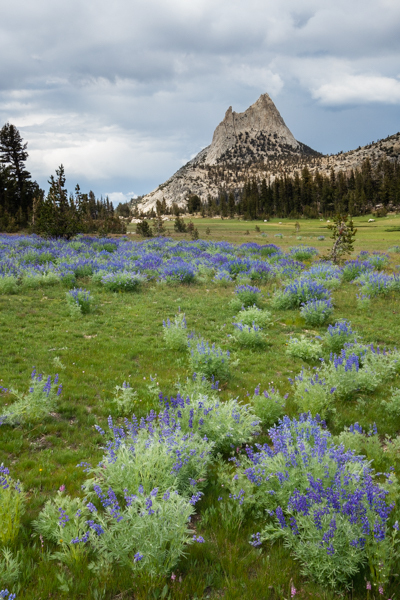 We began day one with a three-hour drive to Tuolumne Meadows to pick up our wilderness permit, and to park our car on the dirt road next to the Lembert Dome parking lot. Then it was YARTS to the valley, followed by a short walk to the Yosemite Lodge, and a bus ride to Glacier Point. We didn’t intend to walk to the Lodge, but the shuttle buses were all so packed with people we couldn’t get on them. We didn’t stay in the valley long enough to get a sense if things have gotten better with Aramark managing instead of Delaware North, but packed shuttle buses (due to a reduced schedule) isn’t indicative of good things. We began walking at about 3 p.m. The timing was not optimum, but we didn’t intend to do many miles on day one anyway. As is usually the case, despite the fact that the valley was crowded, as well as Glacier Point, after five minutes on the trail we felt like we were almost alone in the wilderness. Well, except for that big rattlesnake eating a squirrel! Believe it or not, this is the first time in all my years in the Sierra Nevada that I have seen a rattlesnake. Fortunately, it was busy eating and was uninterested in either of us. After a great night near the banks of Illilouette Creek, we were off the next morning for the top of Nevada Falls along the Panorama Trail. That evening we camped at Sunrise Creek. Joining us at the campsite was a youth group of at least twenty kids (and two guides) ages 12 to 15. It was great to see kids of this age in the woods; I would have guessed that for many it was a first trip. It wasn’t so great hearing their enthusiasm well into the night, but I guess that’s a small price to pay for another generation who will hopefully appreciate the wilderness. The wildflowers were amazing. Once we mistook a field of lupine for a pond because the plants were growing so densely. At another spot a huge field of lupine, at a distance, looked like a purple fog. The wildlife was out in force; we saw just about everything except a bear, including marmots (posing for treats), deer (up close), coyotes (playing in the meadow near Sunrise Camp), the aforementioned rattlesnake, and – by far the most exciting – a mountain lion. He or she was no more than 18 yards from me and appeared to be about 60 pounds. I’d guess the cat was an adolescent considering the size and how flawless the fur was. That is a first for me; I’ve never seen one in the wild. I should note that the mountain lion showed absolutely no interest in either my wife or me, despite the fact we were making enough noise that it must have known we were there. Sorry, but the encounter was so quick that a photo was impossible. We put our mosquito head-nets on once, and used a little DEET once, when we finished the trail near dark on the last day. Overall, the mosquitos were not bad. We had no problem with them at either campsite in the evenings or mornings. Water was plentiful. I would say that Sunrise Creek has at least a few weeks of water left. I zipped up my 20 degree sleeping bag once, at about 5 a.m., on the first night at 6,000 feet. The second night it stayed open all night. We got some rainshowers the last day, which felt great. Not all wilderness adventures need to take weeks. This was three days well spent! I love the rattlesnake picture. A rare moment. Thanks, Derek! It was something! Great, been along that whole route, parts of it multiple times. Miss it so much! (Living in Asia) . . . . I’ve seen lots of rattlesnakes down in Little Yos Valley, BTW, some fat ones, too! LYV seems to be a big rattlesnake area; I’ve even heard of someone getting bitten there. Thanks for the comment, Peter. Funny you should mention that, Luke. That thought occurred to me as well. I estimated twenty. My wife thought it looked more like 25. I assumed that since it was probably sponsored by the Park Service that there was some waiver. I don’t know that they were breaking the rules so I’m reluctant to criticize. Thanks for the question! It would be interesting to know if a waiver were in place. I frequently see large groups exceeding group size limits in Wilderness areas in my neck of the woods (WA, NE OR). I’ve even seen outfitters exceeding these rules. I doubt many people even realize these rules exist, or why. Enjoyed your blog today. Regarding rattlesnakes, I hiked the Grand Canyon of the Tuolumne last year in August. We started at White Wolf and descended to Pate Valley (where you reach the Tuolumne River). There were many rattlesnakes along the trail, always on the uphill side of the trail. We simply kept moving and never approached them which could be threatening to them and cause them to defend themselves by striking. “Many” rattlesnakes are a few too many for me, but I understand they are part of the ecosystem. Thanks for the comment, George! So glad you had a good hike. The photos and wildflowers are beautiful! We dont see a lot of flowers in August. Final preparations are underway for our hike through the High Sierra Loop. Everyone is so excited! Thanks, Diane. By the way, we used the spigot at Sunrise camp for water and thought it tasted awful. I might use a filter or Steripen instead and get water from a natural source. Just a thought. Good luck on your hike! I’ve also never seen a rattler in 20+ yrs hiking the Sierras. I usually hike at altitudes of 8,000 ft or higher & have heard that the cold is a little much for them. The babies don’t always rattle but carry the same amount of venom. I guess the motto here is to sleep in a tent at lower altitudes so they don’t snuggle up with you at night. RIP squirrel. Thanks for the comment, Darryl. I had always heard that about small rattlers as well, but apparently that might not be true. 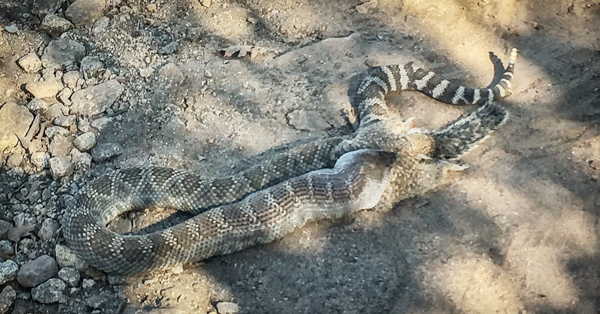 This terrific article is my source: https://www.outsideonline.com/2315436/surviving-rattlesnake-bite. No exposure issues at all, Lee (with the exception of the bridge over the Merced near Nevada Falls – that always gets my attention). There is nothing remotely like Forester Pass. Thanks for the question. What a great summary. I just finished a jmt nobo a few days ago and decided to detour over to the sunrise lakes and over clouds rest since I was a few days ahead and had a few more grinding climbs in me. The flowers were everywhere! So delicate and beautiful. My wildlife viewing experience was opposite yours though. I was concerned about how little I was seeing. A few deer and squirrels ( as yet uneaten) a grouse here and there but generally it felt empty. Glad to hear that is not the case. Congrats on completing your NOBO JMT, Mark! I don’t know about you, but when I do a JMT, after about a week, when I see a grouse I start imagining them on a spit. I can answer the question regarding Aramark. I’ve been to Yosemite 6 times since the change, and I was fairly critical of DNC, so I’ve paid a lot of attention. Probably too much info, but here is my 2 cents. 1. They have noticeably less staff now, and typically, less offerings overall. The Mountain Room menu is cut down, and no longer offers baked potatoes, (seriously…steak with no baked potato?). Service seems much slower to me. The Grill has been completely remodeled, renamed to Basecamp Eatery, and has slightly less seating, less staff, and a slightly smaller menu as well. I used to see employees who previously worked for DNC. They are now gone. I really paid attention to these items in particular, since I used to work in Hotels/Food & Beverage. They are definitely cutting down on costs and quality. Food items are more geared to being “pre-made” in the Mountain Room, in particular (appetizers are mostly cold now). 2. The village store, also has noticeably less offerings, and the tshirts at least, are lesser quality, (I can personally attest to that). 3. The shuttles, as you noticed, are completely full much of the time. At one stop, I had to wait for 3 shuttles before there was enough room to even stand. This is particularly noticeable since it seems with the dedicated bus lane, they are trying to discourage driving. 4. I spoke to an employee who admitted that the focus is more on bus tour groups now, (particularly foreign groups) and they pack as many people as they can in a room, and have purchased roll-aways. This matches my observations. There are noticeably more tour groups. Since Aramark makes no money off the campgrounds, it seems that everything is more geared towards maximizing tour groups, vs families. 5. The dedicated bus lane and traffic circle in the valley has also made things noticeably worse, with more traffic jams. For me….and for the first time in a couple of decades, I have decided to stay away from Yosemite Valley….at least for now. Thanks, Kathy. This is really discouraging. I spent a lot of time in Yosemite as a young man (60s and early 70s), and remember when the situation was far better. I have no real problem with handing over the operation to a contractor, but I simply don’t understand why they aren’t held to a higher standard. Kathy – that all sounds like Aramark won the catering contract through low bid, and the consequence of low bid is low service (you can’t change the price of things, or salaries – much, so the only option is to scale back). Last summer was my first visit since Aramark took over – I wasn’t in the valley long enough to get as good a comparison as you (and my last prior visit was getting married in the valley in 2004), but I definitely agree with the shuttles comment. You really need to sneak in and out of the Valley very early, or very late, or just avoid peak season! Having worked for Aramark years ago, it sounds pretty typical. Maximum return is the only goal. On your trip report, sounds lovely! Getting away from the TH as rapidly as possible seems a good goal. Amazing how all those industrial tourists will never set foot even a mile from “civilization.” The best places are where your feet can take you.